Definition at line 270 of file iterative_linear_solver.h. Definition at line 276 of file iterative_linear_solver.h. Definition at line 282 of file iterative_linear_solver.h. Definition at line 288 of file iterative_linear_solver.h. Definition at line 366 of file iterative_linear_solver.h. References oomph::CG< MATRIX >::Matrix_can_be_deleted, and oomph::CG< MATRIX >::Matrix_pt. Referenced by oomph::CG< MATRIX >::disable_resolve(), and oomph::CG< MATRIX >::~CG(). Overload disable resolve so that it cleans up memory too. Definition at line 300 of file iterative_linear_solver.h. References oomph::CG< MATRIX >::clean_up_memory(), and oomph::LinearSolver::disable_resolve(). Definition at line 351 of file iterative_linear_solver.h. Definition at line 294 of file iterative_linear_solver.h. Re-solve the system defined by the last assembled Jacobian and the rhs vector specified here. Solution is returned in the vector result. Definition at line 946 of file iterative_linear_solver.cc. Solver: Takes pointer to problem and returns the results vector which contains the solution of the linear system defined by the problem's fully assembled Jacobian and residual vector. Definition at line 978 of file iterative_linear_solver.cc. References oomph::DoubleVector::build(), oomph::LinearAlgebraDistribution::built(), oomph::DistributableLinearAlgebraObject::distribution_pt(), oomph::Problem::get_jacobian(), oomph::oomph_info, oomph::DoubleVector::redistribute(), and oomph::TimingHelpers::timer(). Linear-algebra-type solver: Takes pointer to a matrix and rhs vector and returns the solution of the linear system. Definition at line 314 of file iterative_linear_solver.h. 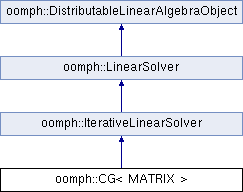 References oomph::DistributableLinearAlgebraObject::build_distribution(), oomph::DistributableLinearAlgebraObject::distribution_pt(), oomph::LinearSolver::Enable_resolve, oomph::CG< MATRIX >::Matrix_can_be_deleted, oomph::CG< MATRIX >::Matrix_pt, oomph::CG< MATRIX >::Resolving, and oomph::CG< MATRIX >::solve_helper(). General interface to solve function. Linear-algebra-type solver: Takes pointer to a matrix and rhs vector and returns the solution of the linear system. Algorithm and variable names based on "Matrix Computations, 2nd Ed." Golub & van Loan, John Hopkins University Press(1989), page 529. Definition at line 625 of file iterative_linear_solver.cc. References oomph::DoubleVector::build(), oomph::DoubleVector::built(), oomph::LinearAlgebraDistribution::built(), oomph::LinearAlgebraDistribution::distributed(), oomph::DistributableLinearAlgebraObject::distribution_pt(), oomph::DoubleVector::dot(), i, oomph::DoubleVector::initialise(), oomph::BlackBoxFDNewtonSolver::Max_iter, oomph::DoubleMatrixBase::multiply(), oomph::DoubleMatrixBase::ncol(), oomph::DoubleVector::norm(), oomph::DoubleMatrixBase::nrow(), oomph::DistributableLinearAlgebraObject::nrow(), oomph::oomph_info, oomph::Global_string_for_annotation::string(), and oomph::TimingHelpers::timer(). Referenced by oomph::CG< MATRIX >::solve(). Definition at line 376 of file iterative_linear_solver.h. Referenced by oomph::CG< MATRIX >::iterations(). Boolean flag to indicate if the matrix pointed to be Matrix_pt can be deleted. Definition at line 387 of file iterative_linear_solver.h. Referenced by oomph::CG< MATRIX >::clean_up_memory(), and oomph::CG< MATRIX >::solve(). Definition at line 379 of file iterative_linear_solver.h. Boolean flag to indicate if the solve is done in re-solve mode, bypassing setup of matrix and preconditioner. Definition at line 383 of file iterative_linear_solver.h.